While the role of international law, including the law of the sea, is integral to understanding how the events in the South China Sea unfold, there are two dominant strands of thought that capture current thinking but limit our understanding of how the law functions within and between the states in the area. These two legal narratives intersect between the poles of justice, power, and order in maritime affairs, and significantly hinder analytical assessment of how the law works in the maritime domain and may be used as a diplomatic tool to solve regional tensions. The first strand views law as an important component in defining the territorial and maritime stakes contested by the claimants. The second frames law as the foundation of justice in a modern rules-based system, an institutional form constructed out of the post-World War II order that is coming under extreme tension in the emerging great-power struggle between the United States and China. From both of these perspectives, the law is used as an evaluative baseline to judge the conduct of states in terms of formal legality or normative legitimacy. While these legal frameworks are undoubtedly important for explanatory and ethical purposes, analysis of the South China Sea disputes must take into consideration alternative roles for law in shaping and restricting states’ conduct. A critical endeavor for researchers and policymakers is evaluating how international law works or matters in the South China Sea disputes—that is, how the law functions within the spectrum of foreign policy decisions made by key actors. This objective is important if we wish to comprehend and map the myriad areas in which the law affects state conduct, diplomatic activity, and strategic calculations. The study of the complex relationship between law, policy, and strategy in the global domain of maritime affairs remains underdeveloped, and the South China Sea disputes present a critical laboratory in which these variables can be studied within the context of the current maritime order. After touching briefly on U.S. interaction with the law, this piece will focus on China’s approach in the disputes. I will turn my attention to the ASEAN positions in posts to follow, in addition to expounding with greater specificity on the relationship of law, justice, and state practice for the parties involved. Understanding the law of the sea’s role in the South China Sea disputes requires situating the law historically in its foundational debate. For over four hundred years, the law of the sea has been pulled between two legal doctrines that are underpinned by strategic implications: “open seas” versus “closed seas.” Since the time of Hugo Grotius and John Selden, the European initiative underpinning maritime law has oscillated between casting the sea as an entity that could be owned (the subject of sovereignty) and viewing it as a liquid form (affording freedoms but not ownership rights). The lengthy process by which states constructed the United Nations Convention on the Law of the Sea (UNCLOS) did not eradicate this tension; to the contrary, many states at UNCLOS sought expressly to “bury Grotius” and the unrestricted right of navigational freedoms during the protracted negotiations. The South China Sea disputes represent but another round in this prolonged debate over the constitutional use of the oceans for closed and open seas purposes. Situated within this history, in what ways does law matter in shaping foreign policy? Predictably, the key actors display a range of behavior in interacting with the law. U.S. foreign policy and its relation to law is perhaps most clear. The United States privileges freedom of navigation as the fundamental basis for the modern law of the sea and allows this principle to guide its practice in water and air. This stems from a reading of socio-legal history that ascribes to maritime law a critical role in modernizing the world’s communications, trade, and cultural linkages. For the United States, the law of the sea is the bedrock of global and civilizational development. When the United States insists that a rules-based order and the peaceful settlement of disputes must prevail, it means what it says and acts to this end. The law of the sea, through UNCLOS, represents “formal justice” for U.S. strategy and policy. The far more difficult case to make is that the law of the sea has a tangible impact on China’s strategic behavior. Because China exhibits such a range of invalid legal interpretations—from the misuse of baseline law to the possible scope of the nine-dash line—and has refused to appear before the arbitration panel constituted under UNCLOS to hear the Philippines complaints against China, while publicly castigating the judges and proceedings, it would be easy to conclude that law has little impact on China’s behavior. Given that Beijing has stated expressly that it will not comply (the paramount test of international law) with the tribunal’s forthcoming award on merits, many conclude that China will continue to use law instrumentally as a form of modern warfare, or “lawfare,” through which the core elements of the maritime legal regime are delegitimized. That said, we cannot know how China will act until the arbitrators outline the obligations with which it must comply based upon what the law requires. Following the verdict, it is possible that China may be given an opportunity to prove its historic case and begin the process of maritime delimitation. Chinese compliance should not therefore be seen as black or white, possible or not, until a verdict is pronounced and the impacted states are given time to act in accordance with their legal obligations. Moreover, what pressures can or will be brought to bear on the parties to comply with the law remains difficult to foresee given the gravity and significance of the case. But has existing international law had an effect on China’s behavior to date? Testing this claim involves looking at China’s practice and action with respect to international law’s two core functions: enabling (facilitating) foreign policy behavior, or constraining (foreclosing) policy options. In other words, is law “shaping” behavior to conform with legal norms or state practice? 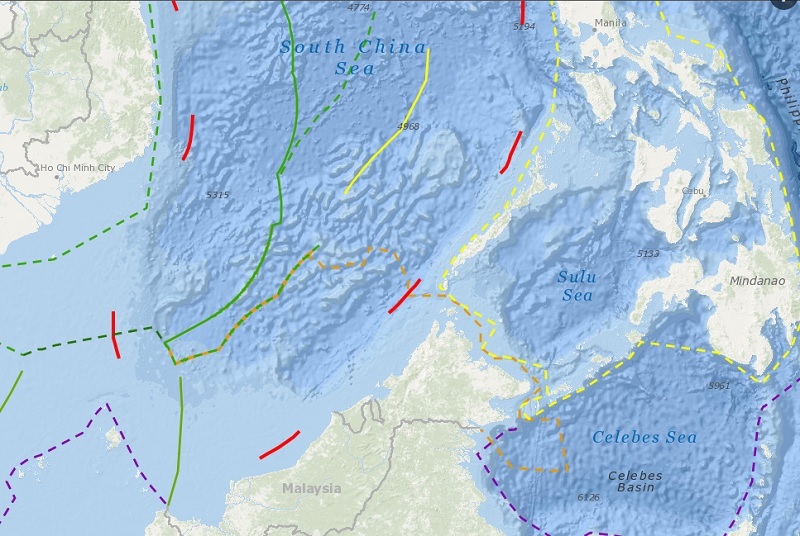 Overlapping claims in the South China Sea. Visit the Interactive Map to explore. International law has in fact both enabled and constrained China’s foreign policy since 2009. In that year, the disputes in the South China Sea began to fall within the “shadow of law” and move toward implicating globally normative interests in upholding the rule of law. Vietnam and Malaysia’s joint submission that year for an extended continental shelf triggered China’s formal reintroduction of the nine-dash line. Given its activities to advance resource extraction projects in the disputed areas, China was pressured throughout 2010 to make its legal position transparent. China gradually realized that it needed the cover of law to provide legitimacy and credibility to its maritime claims. However, the opaque and invalid legal defense it put forward meant that modern law was at this point foreclosing policy options. This changed in 2013 when China, through the writings of distinguished international lawyers, demonstrated how maritime law in the South China Sea should be interpreted to be consistent and binding on China. As outlined by Judge Gao Zhiguo (International Tribunal for the Law of the Sea) and Professor Jia Bingbing (Tsinghua University) in the American Journal of International Law, China had three interpretive options for the nine-dash line: to serve as a basis for outlining sovereignty over just the maritime features; to preserve certain historical rights of fishing, navigation, and resource extraction; or to delimit potential maritime boundaries. These three options, bolstered by the opinion of Judge Xue Hanqin, the Chinese-national judge at the International Court of Justice, consolidated the Chinese legal case. At the official level, China has never formally outlined or confirmed its legal case due to the strategic flexibility this use of ambiguity provides. There are reputational costs for states in not being transparent, but Beijing has decided to absorb these because of the difficulty in making its case within the context of the modern law of the sea. China’s position appears to be that the applicable law for the South China Sea predates the construction of UNCLOS and that its validity survives the creation of this new maritime legal architecture. China believes that it has valid legal claims under customary international law and could apply forms of historical title and/or historical rights (tantamount possibly to an internal waters claim), the application of which renders conflicting UNCLOS articles moot. Given that UNCLOS was constructed after these rights were already in place, they remain in law historically according to China’s legal opinion. China therefore believes that it has both binding law and historical justice on its side in the South China Sea disputes. The upshot is that international law does matter for China and enables its foreign policy, but this reading of law is entirely at odds with contemporary opinion. This is most starkly expressed in the words of the Philippines’ legal team, which argues that historical titles and rights were removed or superseded by UNCLOS. This disparity of interpretation reveals that there is a significant contest unfolding in the South China Sea over which sources and interpretive branches of the law of the sea are valid. Accordingly, the outcomes of this contest will have a profound impact in structuring future legal cases in the Indo-Asia-Pacific and the Arctic region. Though China had a legal defense in place, the 2013 arbitration put the country in a delicate bind. Because of the nature of the questions that the panel of arbitrators was asked to address, Beijing realized that it had a very weak defense in reference to modern legal interpretation. Remaining out of court was the only authoritative advice that China’s legal experts could have given to the Chinese Communist Party (CCP). Initially, then, modern law restricted China’s behavior in removing it from the international dispute-settlement system. But critically the arbitration set in motion the “legalization of the dispute,” making law the dominant frame through which all states’ actions have been evaluated. While Chinese legal scholars (and one prominent European) attempted to argue China’s position on sovereign entitlement in public forums, the process of legalization drew in Indonesia, India, Japan, Australia, and the European Union to demand that the international rule of law prevail. Caught within a legalized regional community, China’s policy then was significantly and materially modified, triggering the intense island reclamation process now underway. In this sense, law facilitated policy change by forcing China to act within a tight policy space. Because Beijing could see that the final scramble for the underwater features was underway in the South China Sea given the industrial capacity of the claimant states, an aggressive foreign policy grounded in a logic of defensive action became its most promising option. Ironically, the move toward legalization has in some part contributed to the expansionary “great wall of sand” we witness today. 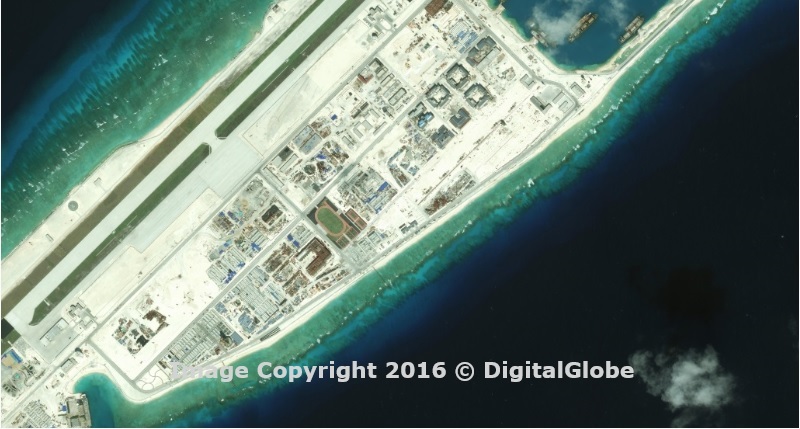 Fiery Cross Reef in January 2016. The pivotal question, of course, is what can be expected from China once the arbitral tribunal has determined the law for the South China Sea on the issues raised in the case. Given how intense Chinese domestic opinion has been about the narrative of historical justice, the CCP will likely subordinate international reputational costs to reinforcing its domestic legitimacy. This outcome is all the more probable given that China will face a verdict that downgrades all possible jurisdictional extensions from the maritime features in question and grants the Philippines full exclusive economic zone resource rights. China, however, is but one party to the South China Sea disputes. Hence, what the region demands of China post-verdict will be critical in evaluating how (and to what extent) the law will matter in the future. No state supports the nine-dash line as law. If China insists on the validity of the nine-dash line on the basis of historical justice, even in light of a ruling that rejects that argument, the world will enter, yet again, a new phase of conflict between the closed and open seas—this time within the militarized neighborhood of the Indo-Asia-Pacific. Justin D. Nankivell is the Associate Dean for Academics at the Daniel K. Inouye Asia-Pacific Center for Security Studies. The views expressed in this article are those of the author and do not necessarily reflect the official policy or position of the Daniel K. Inouye Asia-Pacific Center for Security Studies, the Department of Defense, or the U.S. Government.